No-car camping: is it possible with kids? Can you take a tent into Australia? Can the Clines family travel and sustain an eco-lifestyle? 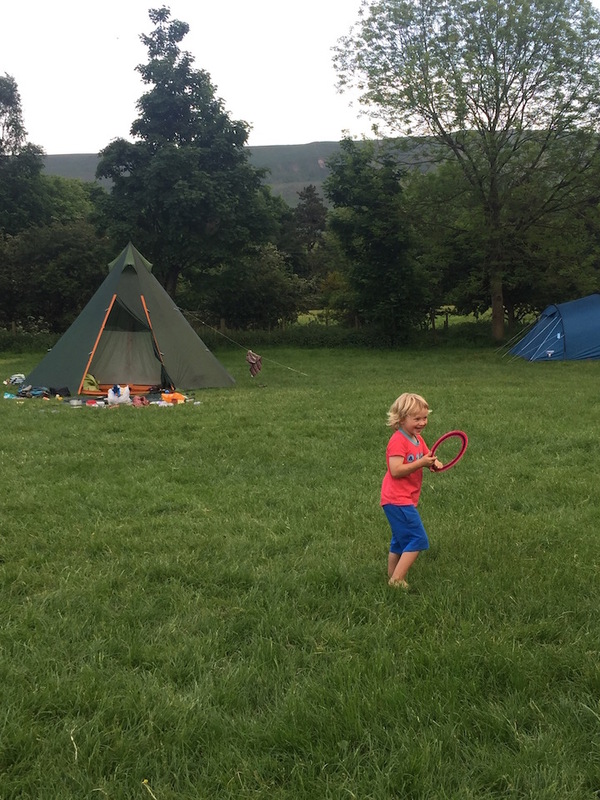 Edale, in the beautiful Peak District, is our go-to no-car family camping spot in the UK. It is accessible by train and there are two campsites 5–10 minutes on foot from the train station. Whether you’re using bicycles or carrying backpacks and possibly a pull-along suitcase (or two), it’s extremely easy to reach. The Hope Valley is simply magnificent. 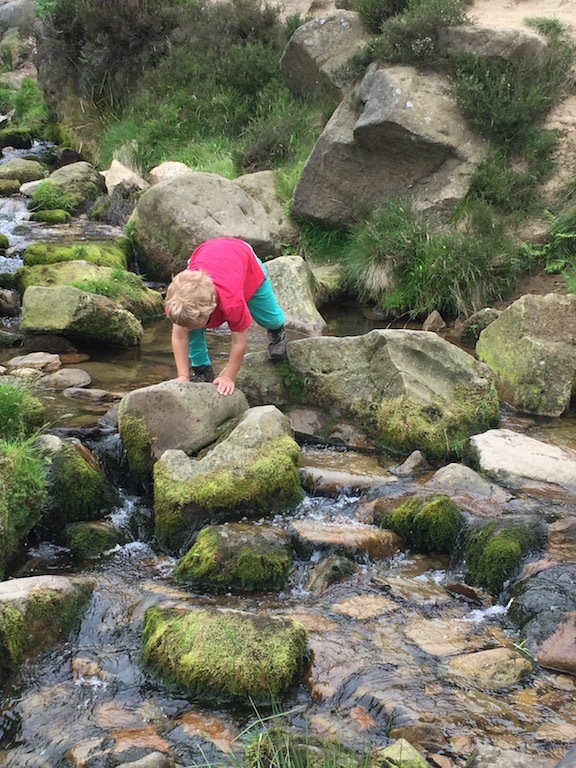 Think high ridges, gritstone edges, limestone outcrops, pretty woodland and burbling streams. Edale station sits down in the valley on the trainline between Manchester and Sheffield. We find it easy to get our bikes on the train as the service starts at Sheffield and we have a little longer to load our bikes and other equipment onto the train. 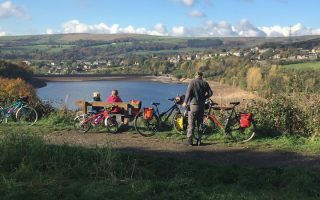 It’s a Northern trainline service that usually has plenty of room – for backpacks as well as bikes- and you don’t have to make advance reservations. Wherever you’re travelling from, it’s easy to change trains at Sheffield or Manchester. 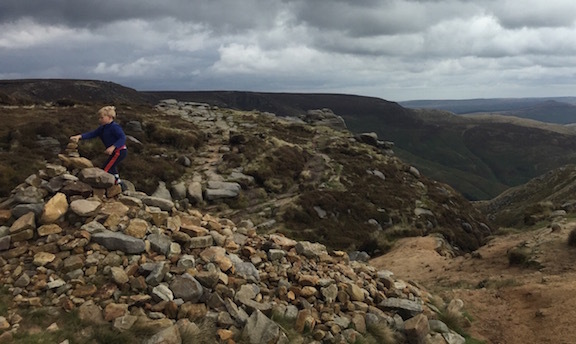 Then sit back as you chug out through the beautiful countryside to Edale. The very occasional long-distance train stops here too. Check http://www.nationalrail.co.uk/ for more details. We always camp at Cooper’s Campsite (01433 670372). Fieldhead Campsite, slightly nearer the station, is flatter and has a drying room but the views at Cooper’s draw us back each time. We arrive in the field, survey the surrounding hills and breath deeply. It’s instantly uplifting. Our bikes are a means of transporting our gear to and from the train station. Once there, the adult bikes usually stay locked up for the duration. The kids like to cycle round the campsite but walking is our preferred activity here. Strenuous hikes or gentle rambles, there’s something to suit all lengths of leg. One of the joys of Cooper’s is being able to see the hills you are planning to climb. If you ask the children, “Do you think you could climb up there?” the answer is usually a resounding, “Yes!” They love the challenge. However, it also helps if they have an idea where they are going. We have done family walks where the children cannot picture what it is we are trying to do and they can easily feel frustrated. In Edale they can see the scope of where we are walking and they are able to accept the challenge. When we get to the top, they can often spot our tent, looking toy-like far below. A rewarding sight. Our children are now familiar with the names of these hills: Mam Tor; The Nab; Lord’s Seat; Win Hill; Lose Hill. They help plan the walks. One of the wonderful things about Edale is how many different interesting paths there are straight from the campsite. 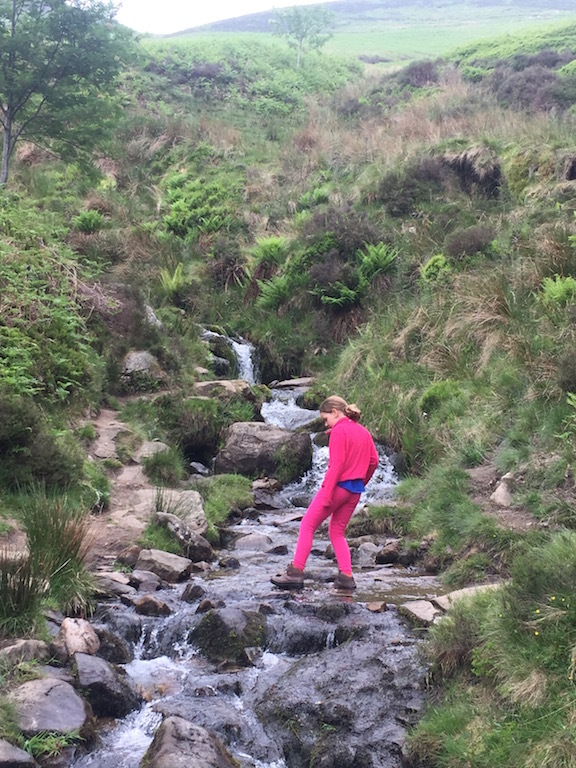 A recent favourite is to scrabble up Grindsbrook Clough to Foxholes. The path is steep with lots of rocks to climb, which is an absorbing activity for the children (and the grown-ups). When they’re really focussed on climbing, they forget to ask how far have they still got to go! We pass the time telling stories, looking for sticks and other treasures as well as chatting and enjoying the views. 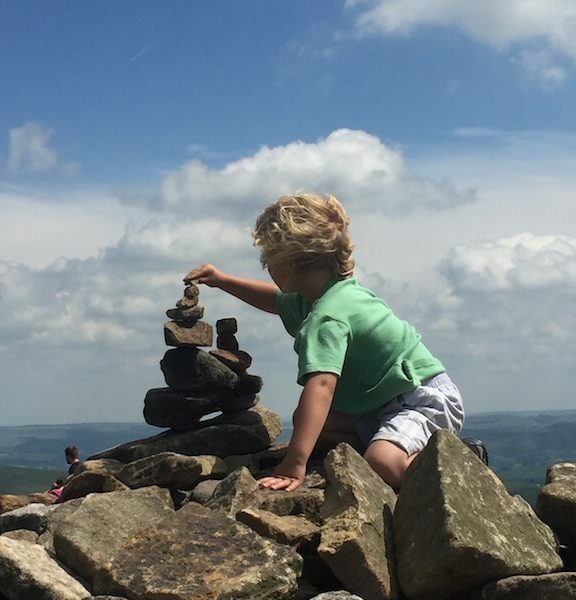 It’s such a sense of achievement when we reach the top and they love adding to the cairns. There are two pubs in Edale village which do pub grub. We tend to cook our own food to keep costs down but sometimes it’s nice to have a treat. There’s a cafe, a chippy and typically we get excited about one meal from the open air wood fired pizza takeaway which offers reasonable prices. A small shop by the campsite sells basics like milk, dried goods and some camping gear, but very little in the way of fresh fruit and veg. 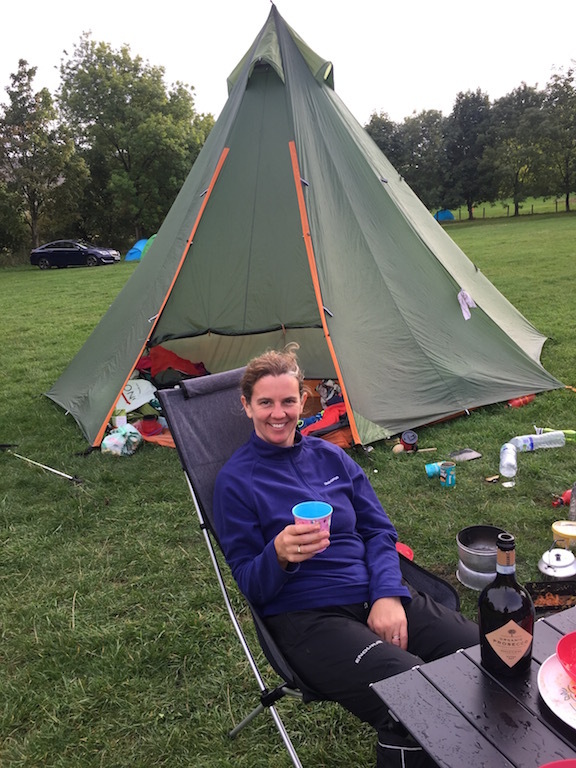 Relaxing after a campsite-cooked meal. When we go for a no-car family camping weekend we can usually carry enough fresh food to last us. However, for a week or more we need further supplies. You can take a seven minute train ride to Hope for a quick stock-up. 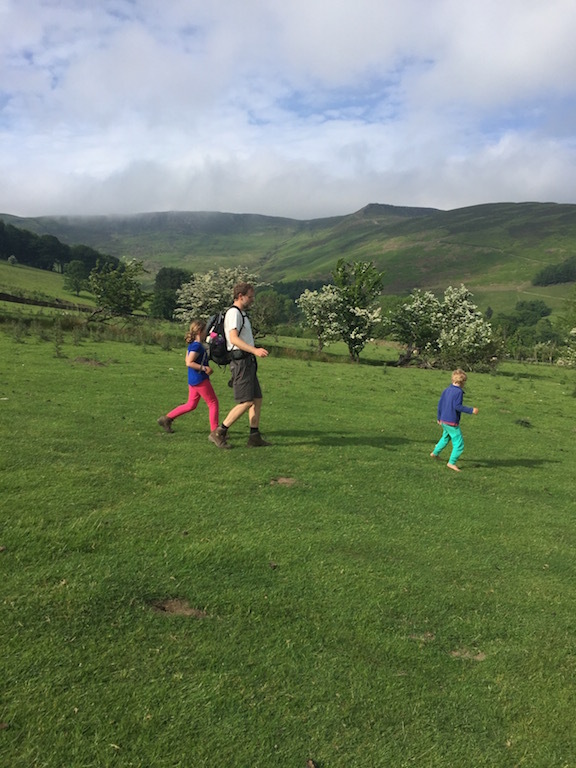 An alternative, though, is to walk the five miles from Edale to Hope (another great family walk), shop in Hope at the lovely Peak Fruits greengrocers and The Hope Chest Deli, then get the train back to Edale with your supplies. Alternatively, on a foul weather day, get the train to New Mills, swim in the leisure centre there, visit the supermarket and get the train back. This is a place that has everything for no-car family camping on a budget. We are all happier outdoors and the setting is stunning. In fact we love it so much there that we often go for a half term and one of the adults commutes back into Sheffield to work on weekdays. We even managed the school run from there one time too! Just don’t forget your waterproofs! You may enjoy reading more about no-car family camping here. Any post on this site may contain affiliate links. We only recommend products / services we personally use and love. Using them doesn't cost you anything but may earn us a small commission. Thanks. Sign up to get email notifications about Eco Family Travel. You can unsubscribe at any time. 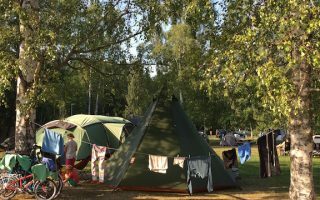 Previous ArticleNo-car camping: is it possible with kids? 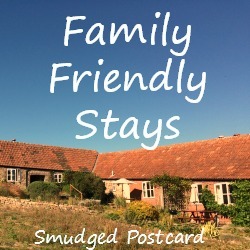 Thanks for setting up #fammilyfriendlystays – great idea. This looks like my kind of camping down to a T! It’s amazing that you can do all this without a car. Love your line about “all lengths of legs”! It’s a factor we take into account too when planning our family hikes. Glad you can identify with it! I agree- it’s often just a matter of thinking a bit differently and tuning in to everyone’s needs. That is the suitable blog for anyone who wants to search out out about this topic. You notice a lot its nearly exhausting to argue with you (not that I really would need…HaHa). You positively put a new spin on a subject thats been written about for years. Nice stuff, just great! ﻿How do you carry your baby or toddler on a bicycle? APRILIA on Can travel as a family be eco-friendly? 2019 Copyright Eco Family Travel. Blossom Mommy Blog by Blossom Themes. Powered by WordPress .